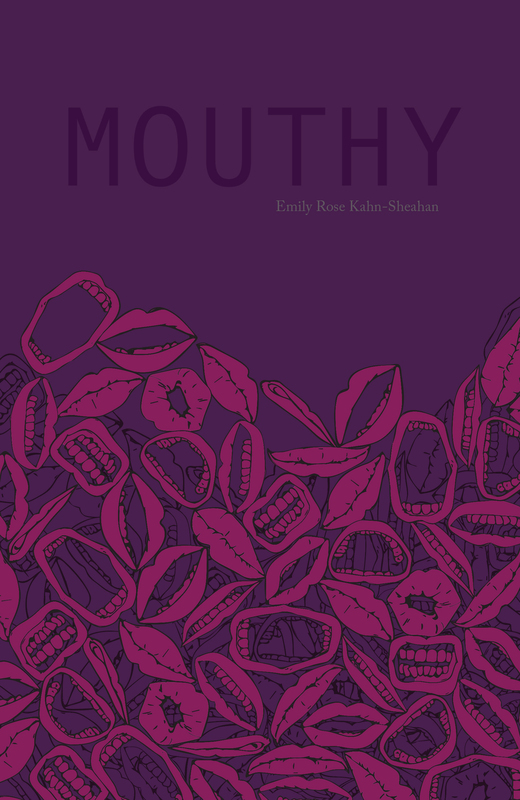 check out this wonderful review of Emily Rose Kahn-Sheahan’s book Mouthy in New City Chicago. Our favorite line from the review: “Mouthy” expresses a self-assured elegance and an implicit argument about women’s self-expression through language and society’s reactions to it. Many thanks to everyone who donated to or shared the kickstarter for Emily Rose Kahn-Sheahan’s wonderful new book. We’ve still got five days to go if you wanted to pre-order the book or snag any of the sweet prizes we are offering. In other news, if you are in Los Angeles from March 30th-April 2nd, Captain Josh Gaines and Emily Rose will be representing Thoughtcrime at AWP. Stop by our table and say hello. We’ll have books, swag, hugs, laughter, whiskey. After AWP, Emily Rose and Ben Clark will hit the road for a two week book tour. East Coast here we come! Holy moly friends! We’re now taking Mouthy pre-orders here. If you have a moment, check out the kickstarter, buy the book, or share with your friends. What a cover, what a collection, what an author. We here at Thoughtcrime couldn’t be more proud of Emily Rose and her incredible poems. We at Thoughtcrime are so proud of, and excited to, share this book with all of you. Hello friends, as you may have already heard, we’ve got a Kickstarter going to help fund the initial run of Ben Clark’s upcoming book. There are bundles of sweet Kickstarter rewards, from letterpressed limited art, to personalized mix cds, to metal t-shirts. Check it out, pass on the link, AND thank you for all your support! this Monday, Little Bones collaborator Stevie Edwards returns with her wonderful new collection Humanly. Please join her to celebrate this great release. Also reading, some of the most beautiful and talented poets in the city: Maya Marshall, Fatimah Asghar, Marty McConnell, Shelley Elaine Geiszler, Emily Rose Kahn-Sheahan, Aricka Foreman, and our own Ben Clark. Free whiskey shot or beer with every book purchased! If you happen to be in Minnesota April 11th, from 3-5 p.m., Thoughtcrime Founder Josh Gaines and author Ben Clark will be reading with this wonderful group of authors in a hotel room: Megan Burbank, Myfanwy Collins, Carol Hood, Brenna Kischuk, Christopher David Rosales, Libby Walkup, and Anne Yoder. Ooh la la. The event is hosted by Ginger Piglet, Pioneertown Lit, Projecttile Lit, and Mixer Publishing who have called it a unique collection of readings by nine resistant, exciting, igniting, odd, and feminist authors from across the country. Please join us at the Le Meridien Chambers hotel. Drinks and hors d’oeuvres will be served. If you are into the facebook, here is the invite. AWP and Champagne. Also, Stevie Edwards! Thoughtcrime Press is busy collecting and editing this year’s manuscripts. A possible perfect bound Little Bones is in the works, and we already have the first chunk of poems by Chicago poet, Emilio Maldonado. Here’s a piece by Write Bloody, and Thoughtcrime Press author, Stevie Edwards. One of three Little Bones poets, Stevie is currently teaching at Cornell University in Ithaca, New York, and is as fine a poet and tour buddy as you’d ever hope to meet. Her first book, Good Grief, was released in 2012 and went on to win the Devil’s Kitchen Reading Award for Poetry in 2013.
the pale raw of new flesh.